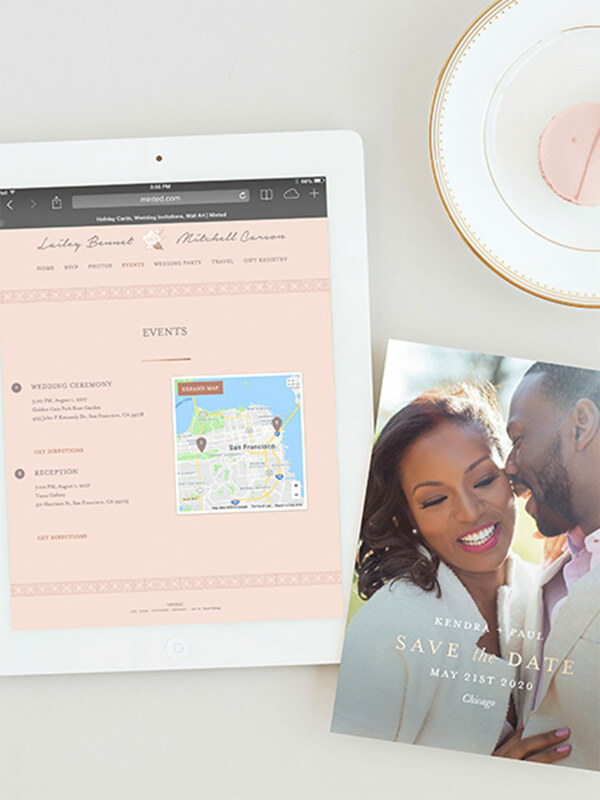 The goal of every good wedding website: Give guests the details they need to prepare for your wedding—and get them pumped to join you for your celebration in the process. 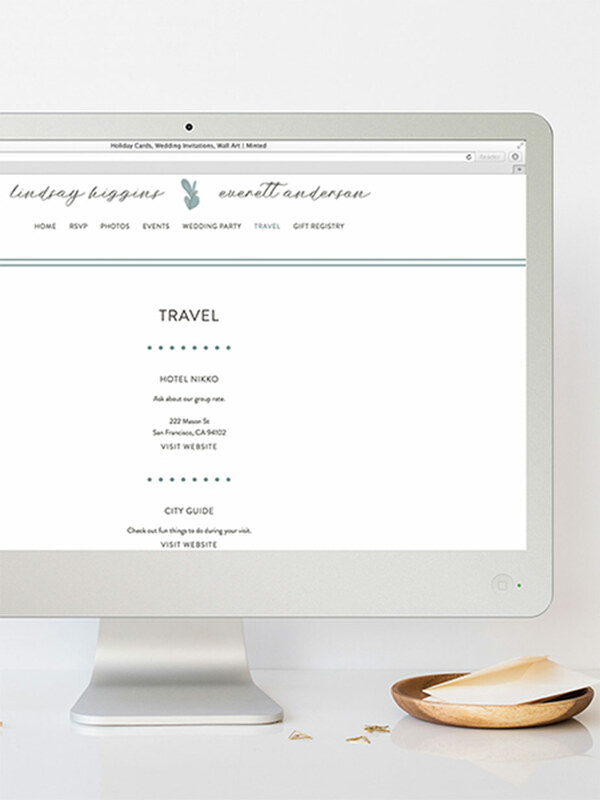 To help you pull it off, follow our handy guide to everything you need to know about setting up your wedding website. While you could certainly build your own wedding website from scratch, for most couples, it’s simpler to choose a stylish template from one of the many wedding website services available. 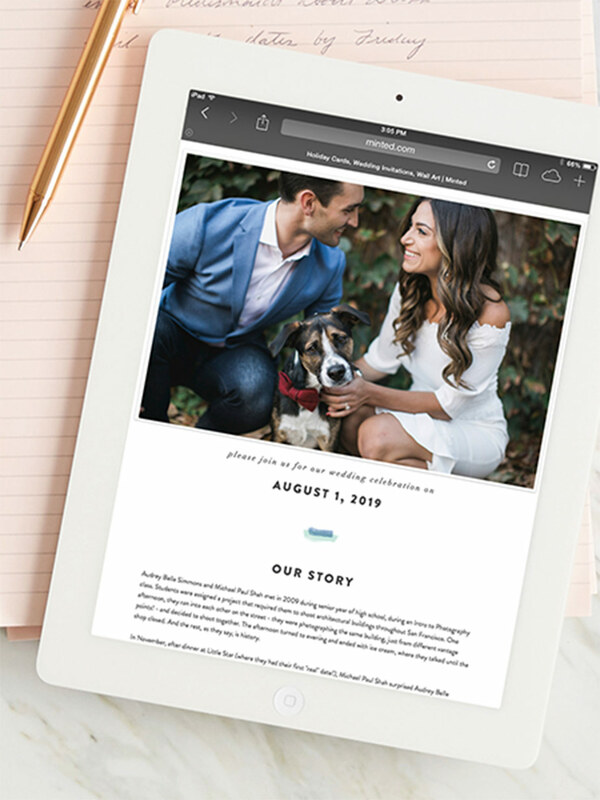 Minted’s custom wedding websites are designed to match their wedding invitations and stationery, which means your guests will experience a cohesive look, from start to finish. Basic wedding website designs are free; premium features ($20) include a photo gallery, a custom URL, and a password-protected site. Welcome guests to your wedding website with a favorite of yourselves and a heartfelt message letting your guests know how ecstatic you are to see them. After all, this is probably one of the only times you'll have all your loved ones gathered together in the same place at the same time. Kind of a no-brainer, but you'd be amazed at how many couples forget to include this vital wedding-day information. Most guests just want to be told where they need to be and when, so be sure to include details on the ceremony and reception start times, as well as extra events like the after-party and morning-after brunch. But only include the wedding events where everyone is welcome to avoid any unexpected drop-ins! Think about what you’d need to know in order to plan a trip and provide this info to your guests so they don’t have to do lots of legwork: lodging suggestions (and any negotiated hotel room rates); a list of local airports, train station, and car rental companies; maps and driving directions; public transportation information (including car services like Uber and Lyft); and wedding venue parking details. Let your guests know how to reach you if they have questions or want to send their congratulations. It's nice to have a catch-all section devoted to any questions about the wedding that guests may have. This is the place to include helpful notes on attire suggestions, whether children are invited (since some guests don’t know the ins and outs of envelope etiquette), a list of reputable local babysitting services, whether you will provide transportation to/from the celebration. Think about all the questions you ask when you go to other people’s weddings and try to include the answers to make life easier for your guests. Recounting your journey together as a couple is a great way to share those funny, memorable, and heartfelt moments that have defined who you are as a couple. You might want to include details about how you first met, your first date, your proposal story, and the most memorable experiences from your relationship so far. This section is particularly helpful for guests like distant relatives or plus-ones so they can get to know you both before the wedding day. Keep this section light and warm-hearted; a bit of playfulness and humor can be a great way to engage with your guests. You can write your story together as a couple, or relay your own versions to show two different points of view. Keep it brief. Remember, you’re not writing an essay! A couple of paragraphs that describe your first encounter, engagement story, and what you love about each other is all you need to provide guests with some insight into your relationship. Many couples opt to include a section with a brief bio of wedding-party members describing how they know each person. 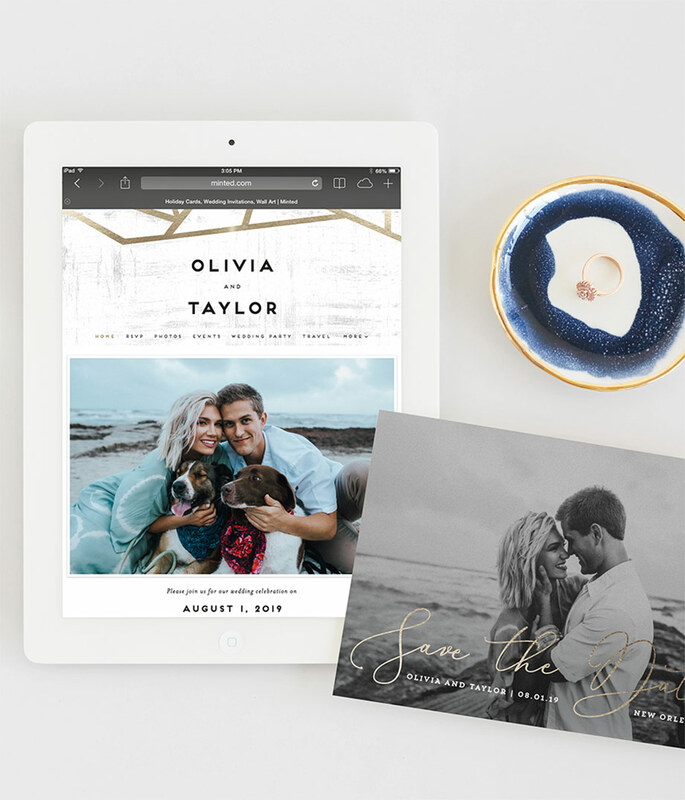 Printing registry information on your actual invitation is usually not advised by etiquette experts, so your website is the perfect place to include these details (be sure to supply links that allow them to click through to shop). If many of your guests are traveling to your city for the first time or if you're hosting a destination wedding, then they will appreciate suggestions on local sights and attractions. Provide a helpful guide to the area by making a list of your and your groom's favorite spots: restaurants, coffee shops, hair and nail salons, local tourist attractions. And if the area has special significance to you, let guests know! For example, if you met, went on your first date, or even got engaged near the wedding venue, those can be fun facts to share. If you had engagement photos taken, this is a great place to display them. But don't go overboard: One of guests' biggest gripes about wedding websites is the never-ending photo gallery. So pick the best ones from your engagement session and a few favorite snapshots of you and your fiancé, and you're all set. How to word your wedding invitations. Read more.